The Apartments Canggu offers a great deal in its combination of 9 bedrooms in two choices between 3 one bedroom apartment with open living space and fully equipped kitchen, while another choice is the 6 studio apartments with fully equipped kitchen, dining space and sleeping space. The apartments are designed for casual elegance, air conditioned, and equipped with most amenities, flat screen TV and DVDs, en suite bathroom with a shower, a spacious 9 x 4 meters shared swimming pool with decking and sun loungers, overlooking a rice field. Daily housekeeping service, laundry, security at night, concierge service, car and motor bike rental and security box. 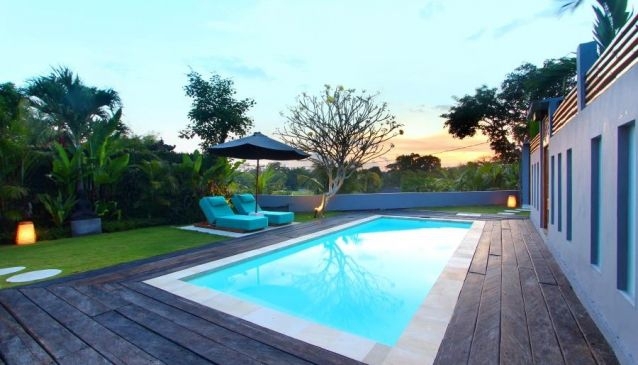 The Apartments Canggu is only 3 minutes' drive to Echo Beach - one of the most renowned surfing beaches in Bali and about 20 minutes' drive from the trendy town Seminyak, where guests can find shopping centres, boutiques, clubs, bars, restaurants and fabulous hanging out places.